North Korea plans to launch a long-range rocket between 10 and 22 December, KCNA news agency says. The KCNA agency said the aim was to launch a satellite. Previous – unsuccessful – launches have been criticized as breaches of a UN ban on North Korean ballistic missile tests. The announcement is likely to increase tensions with North Korea’s neighbors, with South Korea expressing concern over Pyongyang’s announcement. South Korean officials called the move a “grave provocation” and a “challenge to the international community”. The atmosphere in South Korea is especially tense as the country prepares for a presidential election scheduled for 19 December. 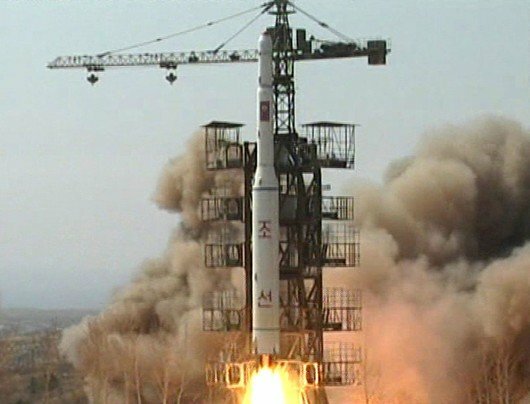 North Korea’s most recent rocket launch, in April, was a failure. The US, Japan and South Korea said the rocket flew only for a short time before breaking up and crashing into waters off the Korean peninsula. Earlier this week South Korea halted a satellite launch minutes before take-off after problems were found during the final checks. North Korean scientists and technicians had now “analyzed the mistakes” of the April launch, the Korean Committee for Space Technology said, via KCNA. The rocket will be of the same Unha-3 variety as was used in the April test. It will be launched “southward” from the Sohae base near the Chinese border, KCNA said, implying it would be directed over the East China Sea. The flight path had been chosen to avoid debris falling on neighboring countries, the agency said. “Unha” is Korean for “galaxy”, and is the name given by North Korea to the space launcher version of its Taepodong-2 missile, which has an estimated range of 2,200km. The missile has not yet been successfully tested. There had been recent speculation that North Korea would attempt another launch soon, with a UN Security Council committee on Thursday warning the country against such a move. Saturday’s statement insisted the forthcoming launch would be for “peaceful purposes”. The test will be the second to take place under the leadership of Kim Jong-un, who took over leadership of the country after the death of his father Kim Jong-il almost a year ago.